I think our society equates stress with success. It's as if stress is treated as a daily part of the job and a healthy thing to experience in our job duties. I too have felt entirely consumed by stress with my career as a school psychologist. There were always so many children to see, papers to write and duties to uphold. Everyone needed something from me, and I often came home drained with nothing left to give my family. I was so wound up. I could cry at the drop of a hat, often found myself in a loop of negative thoughts and had to work overtime not to let myself slip back into a deep, deep depression. Without getting into specifics, I too had to make some life-altering changes. I know I share a lot of personal things on the blog, but I am not entirely ready to talk about my career or the significant changes I have made in it. I don't mean to be cryptic. There are just some personal things that I need to keep to myself for a bit. I hope that makes sense. It's been a while since I have written about my mindfulness practice. The truth is, I have let my practice slip a bit since becoming pregnant and it dawned on me that I needed to bring it back into my life. Even though I am in a good place overall, I know that keeping a consistent practice is key to maintaining my well-being. So I thought I would share some things that I am doing to stay grounded. No Recording Instagram Stories in the Morning: I am taking a more active role in stories. 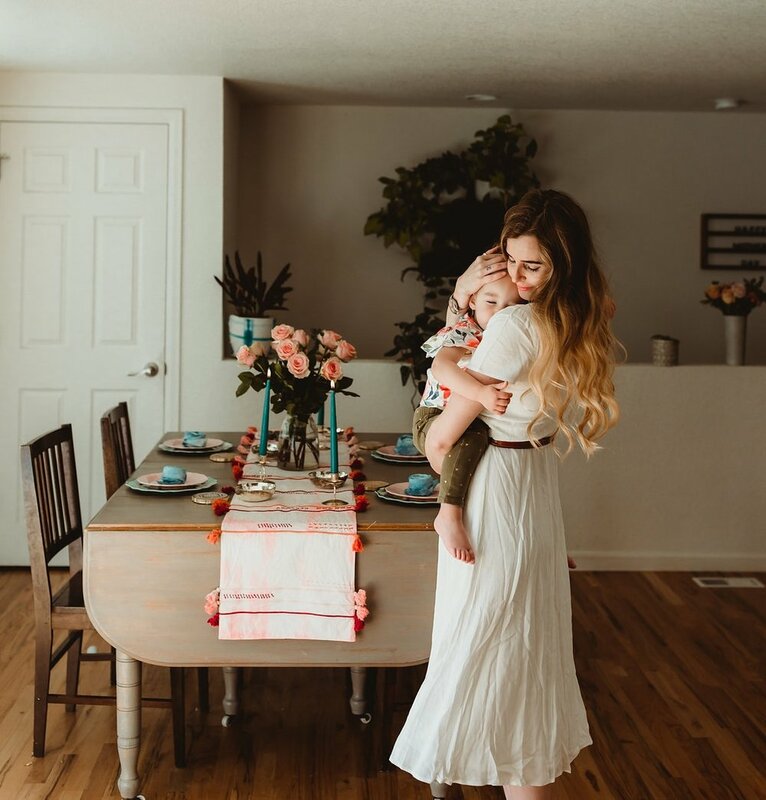 Trying to connect with you more on a daily basis and sharing things from my daily plans, how my pregnancy is going and things I currently love---especially clothes! I used to do stories that mainly focused on Winter, recording those cute moments throughout the day and then uploading them to the platform. But I began to notice something that I didn't like. I would reach for my phone too often, press record and then Winter would stop doing what she was doing. I would inevitably disrupt her play and entirely miss out on the opportunity to be a present observer and soak it all in. I now only try to record her once a day, if that. I notice that I am not constantly distracted by trying to get the shot and we are spending our mornings together in sync, without disruption or the threat of the phone. It's been really lovely. Teaching Winter About Emotions: Winter and I have dived into social and emotional learning. I have taught mindfulness and the five social-emotional competencies (self-awareness, self-management, social awareness, relationship skills, and responsible decision making) to hundreds of children and I think it's so important that I transfer these skills to my own daughter. We spend at least once a day reading books about emotions, playing emotion games, practicing breathing or yoga and more. I plan to go into detail about what materials and activities I use, so stay tuned for that! I just loved how great she is getting at identifying her feelings and feelings of others. It makes me so proud to be an integral part of her social and emotional learning. And by teaching her every day, it helps me check in with where I am to make sure I am processing everything I need to as well! Keeping A Line-A-Day-Journal: I have raved about this journal before! I have had it for nearly five years, and the pages are almost all filled up. Every night, I write down one thing I want to remember from that day. Of course, there are days or often months where I forget to, but overall, I have been pretty good about writing in it. I cannot believe that I am almost half-way through this pregnancy and I find that I want to document everything that Winter is doing, or what we are doing together as a family of three, because I know in a few short months our whole dynamic will change. I just want to make sure I remember these days! There is a generic version of the journal here and a mom-focused journal here. I also wanted to thank you guys for reading my blog. I never dreamed in a million years that I would have such a loyal community and I want to send you a huge air hug now!